What's 20 or so million SSNs between friends? Ramona Joyce, spokeswoman for the American Legion, agreed that the theft was a concern. "In the information age, we're constantly told to protect our information. We would ask no less of the VA," she said. Nicholson declined to comment on the specifics of the incident, which involved a midlevel data analyst who had taken the information home to suburban Maryland on a laptop to work on a department project. "I want to emphasize there was no medical records of any veteran and no financial information of any veteran that's been compromised," Nicholson said, although he added later that some information on the veterans' disabilities may have been taken. Sen. John Kerry, D-Mass., who is a Vietnam veteran, said he would introduce legislation to require the VA to provide credit reports to the veterans affected by the theft. "This is no way to treat those who have worn the uniform of our country," Kerry said. "Someone needs to be fired." Sorry, but firing people is not going to fix this problem. Instead, maybe GWB could increase his popularity by adopting Pete Lindstrom's modest plan to Eliminate the SSN Facade. And while we are at it, why not write the Laws of Identity into the Constitution? Ok, maybe not on that last one, but how about we use the Laws in the systems we build? I like Pete's Modest Proposal to publish SSNs, I mean everyone gets up in arms about not taping your password to your monitor, but do 150,000 people walk by your monitor? Well, it was not too long ago, all the security pundits were telling us how bad web services are for security, and some are still saying this right? Of course when someone tells you some technology is "bad" for security, the proper response is always: compared to what? So SOAP is somehow worse for security than DCOM or RMI-IIOP? Remind me all the great security tools that shipped with those protocols again? There are many other crucial technologies today, which are important for integrating webapps into a portal. It is curious to read forums where people bash things like portlets and WSRP and XACML and such. "Why would we want to run portlets in two servers? My Struts app works just fine on one Tomcat instance". Amazing. When you have been exposed to real-life DMZ environments a couple of times you start to wonder how the heck we get anything done *without* stuff like WSRP and security integration specifications like XACML and SAML. The conclusion appears to be that developers that don't get it simply aren't exposed to the realities of actually running the apps. For development it might make no sense to have several servers, or integration technologies like SAML and WSRP, but for real deployments they are essential. As long as application developers are in the dark with regard to these basic realities systems integrators are going to keep using hack upon hack in order to make house-of-cards type integration of apps. Precisely the point, not only are Web Services not turning out to be "bad" for security, but the standards that they are generating - SAML, XACML, WS-* - are giving developers better security tools than they have ever had before. Identity projects, like any other integration project, yield confusion because of disparate stakeholder needs and understanding of definition. This is a new discipline for security projects which are typically nowhere near as customer-facing as software development projects, but with identity management security team are exposed directly to lots of stakeholders. On top of that identity projects are laden with lots of legacy terminology baggage like roles. If you ask 5 IT people about roles you will get (at least) 6 different answers, managers talk about functional roles, BAs talk about domain roles, developers talk about user principal roles, and directory architects...of course know what roles really are...er..talk about LDAP roles. This makes this word harmful to building up understanding, it is this way with many concepts in identity and access management. Vendors make the problem even worse. Start with an identity architecture that defines the entities and their relationships. Publish prescriptive, positive definitions and examples help to reduce confusion. Fight ident-ebonics misunderstanding with use cases to generate shared understanding of the space, structure, and behavior. You cannot integrate what you cannot agree on. My paper on Service Oriented Security Architecture from the Nov. issue of ISB is now online. The paper describes an approach to dealing security design and architecture issues in developing Web Services and SOA software. The primary goals are to illustrate a set of key analytical areas, and a way to synthesize these relationships. As Kruchten and others observed separation of concerns is an useful technique in software architecture. In security architecture, it is useful as well, and in addition separation of assets yields a more robust risk management model. 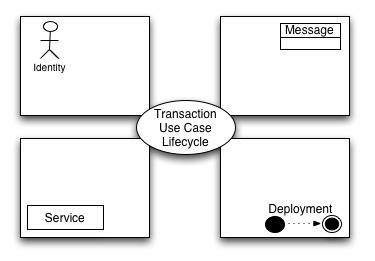 In the case of this paper, the assets are separated as Identity, Message, Service, Deployment Environment, and Transaction. This way the risks and countermeasures can be understood and the elements and constraints dealt with in their own domain to the extent possible. A universal system must embrace differentiation, while recognizing that each of us is simultaneously—and in different contexts—a citizen, an employee, a customer, and a virtual persona. Abstraction is about the best tool we have in programming, it is nice that in 2005 we are actually using it for identity. In this interview, Ping Identity CEO/Founder, Andre Durand discusses the recent Trustgenix acquisition, the state of Federated idenity (are we still waiting for the big bang? ), and the ideas behind starting Ping. The next five years might be characterized by the entire ID management stack becoming standardized, where the interfaces between everything are standards. What's interesting about all of this is while you have a tightly integrated, proprietary suite from the vendors on the one hand, which is very self-serving, on the other hand, you have almost the opposite thing happening: a modular, loosely-coupled stack with standards in between. With this, companies can pick and choose best-of-breed authentication and tie it to best-of-breed policy, where all of the vendor products are interoperable. Therein lies the big, long-term opportunity for Ping because we started at the beginning of this modularization. One of the strengths of the Internet has been the fact that it inverted the telecom model, where the network was smart and the end device (the phone) was dumb. The traditional Internet featured a relatively dumb network whose main job was to get traffic from point A to point B. The intelligence was found in those end points. This Internet model simplified troubleshooting and allowed a plethora of protocols to be carried from point A to point B. With so-called "intelligent networking," points A and B have to be sure that the network will transmit their conversation, and not block, modify, or otherwise interfere with that exchange to the detriment of the end hosts. As a security person I am obviously in favor of efforts to enforce security policies, but I am not in favor of adding another layer of complexity on top of existing infrastructures if it can be avoided. Now network security mechanisms are great. And networks are a great place to deploy some securiyt mechanisms, because they have the potential for visibility and scalability at a system level. But what about the "smart" part of the system? Shouldn't they have security, too? What is the proportion of your organization's IT security spend on security for the network versus the other areas of the system? When you focus on securing the network you are improving assurance of your dialtone, but what about payloads, logic, behavior? It is much more difficult to map security onto the apps, databases, hosts, et. al. in some cases, this is why we have not seen a huge vendor presence in this space, and vendors drive a lot of the security market. But that does not mean we should not do it, after all that is the solution space. Bruce Sterling wrote in Tomorrow Now that our current healthcare and medicine models are obsessed with hygiene, but in reality hygiene is just admitting that we are clueless about microbes, and the immune system -- you know -- the stuff that actually keeps us alive. Hey, I am not against hacking away and using things like network security and hygiene, I even use them both myself, but let's not think that these are the end goals in and of themselves.